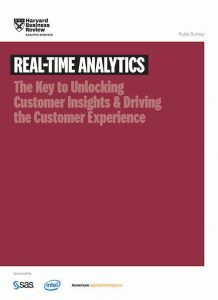 In today’s marketplace, brands need to differentiate themselves by delivering a unique, real-time customer experience across all touch points—one that is based on solid, connected business strategy driven by data and analytics. This survey, conducted by Harvard Business Review Analytic Services, examines how brands can gain the ultimate competitive advantage by unifying the analytics life cycle from data to discovery to deployment. Download the survey and find out why understanding customers and anticipating their needs at every point of interaction is essential to a company’s ability to compete in the future.